To subscribe to the Cobber Athletic E-Mail Newsletter, featuring regular updates on Concordia athletics, simply click on the address below and type "Subscribe Cobbers" as your subject. 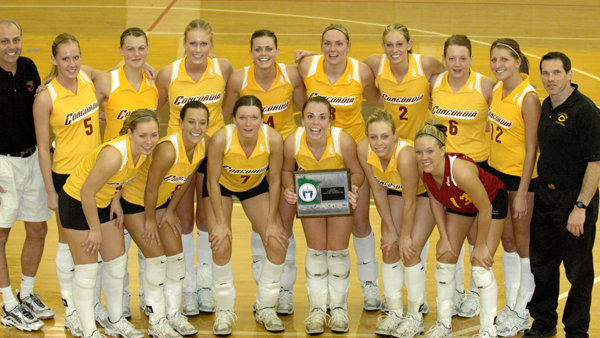 Concordia Volleyball Schedule for 2005 Now Online! Jessica Walden is One of Three Cobber Fall Athletes Earn NCAA Postgraduate Scholarship! MOORHEAD-- Three Concordia fall athletes were awarded a prestigious NCAA postgraduate scholarship. Nick Myran (Sr., Kenyon, Minn./Kenyon-Wanamingo HS) from the cross-country team, Jordan Talge (Sr., Moorhead, Minn.) of the Cobber football team and Jessica Walden (Sr., Hawley, Minn.) from volleyball all earned the $7,500 award sponsored by the NCAA. Concordia had the most athletes awarded the scholarship of any NCAA Division I, II or III institution. The list of colleges or universities that had athletes win awards included: Duke University, Stanford University, Boston College and North Dakota State University. The three Cobber award-winners also represent the most by any MIAC school in a single season. Jessica Walden Named to the ESPN The Magazine Academic All-America First Team!!! Senior Jessica Walden (Hawley, Minn.) capped her storied career at Concordia by being named to the ESPN The Magazine Academic All-America First Team in the College Division as selected by CoSIDA. She was the only student/athlete from the MIAC to earn Academic All-America honors, and becomes only the fourth player in the history of the MIAC to earn Academic All-America First team honors. Walden is the first player in the history of the volleyball program to be named an Academic All-American. She joins football's Jordan Talge (Sr., Moorhead, Minn.) in becoming just the 10th and 11th honoree from Concordia to earn Academic All-American honors as voted on by CoSIDA. They are the first student/athletes to earn Academic All-America honors since Micah Benson was named to the Track and Field Academic All-America First Team in 2000. Becca Shane Named to the AVCA All-American Second Team! COLORADO SPRINGS, Colo.-- Becca Shane (So., Detroit Lakes, Minn.) became the second player in program history to be named an All-American. Shane was named to the AVCA All-American Second Team. Teammmates Jacki Barten (Sr. Melrose, Minn.) and Jessica Walden (Sr., Hawley, Minn.) were named to the All-American Honorable Mention Team. Shane is one of only two players from the MIAC to be named to either the first, second or third team. The only other conference player was Beth Freeman of Carleton, who was named to the All-American Third Team. Three Cobber Players Earn AVCA All-Region Honors!! COLORADO SPRINGS, Colo.-- Three Concordia volleyball players earned All-Region honors it was announced by the American Volleyball Coaches Association (AVCA) on Wednesday. It is the first time in program history that three players have earned the Central Region's highest honor. All three are now eligible to be awarded All-American honors. Jacki Barten (Sr., Melrose, Minn.), Becca Shane (So., Detroit Lakes, Minn.) and Jessica Walden (Sr., Hawley, Minn.) all earned the All-Region award. It was the second consecutive year that Barten has won the award, and first for both Shane and Walden. Last year Barten was the first player in program history to be named to the All-American Team. In 2003, Shane was voted the Region's Freshman of the Year and Walden was named to the Region Al--Conference Honorable Mention Team. Jessica Walden Earns CoSIDA Academic All-District First Team Honors! Concordia senior setter Jessica Walden (Hawley, Minn.) was named to the CoSIDA Academic All-District V First Team. She is the only player from the MIAC to receive first team honors. In 2003, Walden was named to the CoSIDA Academic All-District Third Team. Walden is now on the national ballot for consideration to be on the CoSIDA Academic All-American Team. The prestigious award is given to only six players in the College Division of the Academic All-American award. 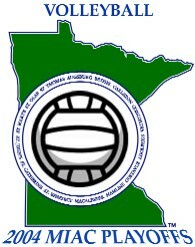 The College Division team includes players from Division II, III and NAIA from Minnesota, Wisconsin, Illinois and Indiana schools. Sophomores, juniors and seniors are eligible to be nominated. Walden was one of 100 players nominated for the six spots for the district award. It is one of the toughest sports and districts to earn Academic All-District honors in all of college athletics. Walden was an integral part of the Cobber team that set a school record for fewest losses in a season and highest winning percentage in a season. Concordia won the MIAC tournament championship for the second straight season and advanced to the NCAA for the second straight year. Walden carries a 4.00 grade point average, while majoring in Biology and Psychology. She was named the MIAC Most Valuable Player in 2004 and was named to the MIAC All-Conference Team for the third straight year. She set the school record for assists in a career, assists in a season and assists in a match. She strung together three, 1000+ assists seasons and finished her career with 4,513 assists. In her career she was named the MIAC Setter of the Week a record-setting eight times. Walden was a member of the Dean's List for three years and a four-year member of the Student Athletic Advisory Committee (SAAC). Cobbers' Record-Breaking Season Comes to a Sudden End. La Crosse, Wis.-- The end came quickly and was administered with an authoritative blow. Concordia's record-setting season came to a sudden, crashing stop as UW-Stout swept the Cobbers 3-0. The Blue Devils will advance to the region final to play UW-La Crosse who beat UW-Whitewater 3-2. Business-Like Cobbers Sweep Lakeland (Wis.) to Open 2004 NCAA Tournament. La Crosse, Wis.-- Last year the Cobbers were content to be in the NCAA tournament and happy with anything that came their way. This year the Cobbers have higher aspirations and have a business-like attitude. Concordia calmly dispatched Lakeland (Wis.) 3-0 (30-18, 30-23, 30-23) in the first round of the NCAA Midwest Regional, and advances to play UW-Stout on Friday, November 12 at 4:30pm in the regional the semifinal. Déjà Vu All Over Again - Cobbers Going to UW-La Crosse to Play in Midwest Regional. The College Sporting News Article on the MIAC Championship Match. Cobbers Bombard Carleton to Claim Second Straight MIAC Tournament Crown! Matchday Menu: Match Recap - Box Score - All-Tournament Team - Action Pictures NORTHFIELD--Championship teams respond in big games, and after claiming the MIAC tournament title in 2003 and winning 19 straight matches in 2004 - the Cobber volleyball team had proven that it is a championship team. If there was any remaining doubt that the Cobbers were not at the top of their game, it was very quickly put to rest, as Concordia demolished regular season champion Carleton 3-0 (30-27, 30-23, 30-19) to claim their second straight MIAC tournament title. With the win, the Cobbers earn the league's automatic bid into the NCAA playoffs. It will be the second straight season Concordia has participated in the NCAA championships and fourth appearance in program history. Cobbers Sweep St. Ben's, Advance to MIAC Title Match! MOORHEAD-- Concordia picked up where they left off last season in the MIAC playoffs by completely dominating St. Ben's and cruising to a 3-0 (30-23, 30-27, 30-20) victory in Moorhead. The Cobbers swept St. Ben's for the second straight match and advance to the MIAC championship game on Saturday, November 6 at 7:00pm at Carleton. The Knights, the league's #1 seed, beat St. Thomas 3-1 in the other MIAC semifinal. Concordia had three players in double figures in kills. Becca Shane (So., Detroit Lakes, Minn.) had a team-high, 13 kills, Amy Fitzner (Sr., Valley City, N.D.) recorded 12 and Kris Sather (Sr., Fosston, Minn.) had 11. Fitzner also tallied a match-high 22 digs. Emily Gilbertson (So., Alexandria, Minn./Jefferson HS) continued to give the Cobbers a stellar defensive presence. She finished the match with 17 digs. Three Concordia Players Earn MIAC All-Conference Honors! Jessica Walden Named MIAC MVP! ST. PAUL-- Three Concordia players earned MIAC postseason awards announced by the league office on Wednesday. Jacki Barten (Sr., Melrose, Minn.), Becca Shane (So., Detroit Lakes, Minn.) and Jessica Walden (Sr., Hawley, Minn.) all earned MIAC All-Conference honors. Walden was also named the league Most Valuable Player, marking the first time in program history that the conference's top honor goes to a Cobber. For Barten it is her fourth straight year that she has been named to the all-conference team. That is also a first in program history. It is the third consecutive year that Walden has been named to the all-conference team. Shane earns all-conference honors for the first time after being named the league's Rookie of the Year in 2003. Jessica Walden Named the MIAC Setter of the Week. - Senior Sets MIAC Record for Most Player of the Week Honors in a Career! Concordia senior setter Jessica Walden (Hawley, Minn.) was named the MIAC Setter of the Week as she helped the Cobbers beat St. Ben's in a critical three-game sweep. It is the second time this season, and eighth time in her career, that she has won the award. That sets an MIAC record for Player of the Week honors in a career. Katie Reynolds from St. Thomas held the old record by amassing seven Player of the Week awards from 2000-2002. The honor marks the fifth time that a Concordia player has won the Player of the Week award this season. Walden led the Cobbers to a crucial 3-0 win over Saint Benedict last week in a match that clinched second place in the MIAC for Concordia. Walden collected 51 assists (17 assists per game), setting a Concordia record for assists in a 3-game match. In addition, she had 12 digs (4 dpg) and two kills. 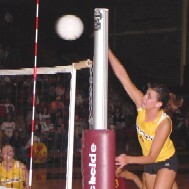 Walden directed the Cobber offense to 61 kills and a .199 hitting percentage. Cobbers Leave Little Doubt In Capturing Second Place. MOORHEAD-- In front of a record-setting, senior night crowd, Concordia methodically claimed the second seed in the MIAC tournament by battering St. Ben's 3-0 (31-29, 30-23, 30-26). The victory gives the Cobbers sole possession of second place in the MIAC, and jumpstarts their bid for their second consecutive MIAC tournament crown. Concordia will host the winner of the #3 Blazer/#6 St. Mary's match on Thursday, November 4 at 7:00pm. Cobbers Remain Locked in 14th Place In the Latest CSTV/AVCA Poll!! Becca Shane Named the MIAC Hitter of the Week. Concordia sophomore middle hitter Becca Shane (Detroit Lakes, Minn.) was named the MIAC Hitter of the Week as she helped the Cobbers beat St. Thomas in five games. It is the first time this season, and second time in her career, that she has won the award. She becomes the third Cobber to win Player of the Week honors this season. Shane played a tremendous match in Concordia's 3-2 win over St. Thomas last week. Shane tallied 26 kills (5.2 kpg) and 8 blocks (1.6 bpg) while hitting .444. Her 26 kills tied her all-time best at Concordia. She is among the MIAC leaders in hitting percentage, kills per game and blocks per game. Shane has played in all 85 games the Cobbers have played this season and currently leads the team in kills (321) and hitting percentage (.322). The College Sporting News Feature on Jessica Walden. As the aphorism goes, records are made to be broken. Breaking a record requires a level of determination and drive, particularly when chasing a career record. For an athlete to enter their senior year having already broken a school career record is something special, and doesn�t happen often. But for Jessica Walden of Concordia College, doing unique things is pretty much the norm. Cobbers Stop Losing Skid at Two; Beat St. Thomas 3-2 to Clinch MIAC Playoff Berth! Despite Losing Two, Cobbers Remain Steady at 14 In the Latest CSTV/AVCA Poll!! Cobbers Fall for the Second Straight Time. Cobbers Can't Reel Knights All the Way Into the Boat, Fall for the First Time in 20 Matches. Cobbers Sweep Their Way Into the Record Book! Cobbers Climb Into the National Top 15 for the First Time in School History!! Jacki Barten and Jessica Walden Earn MIAC Player of the Week Honors! A pair of Concordia seniors earned MIAC Player of the Week honors for their role in winning the Minnesota/Iowa Border Battle Tournament, and helping the team tie the school record for most consecutive wins. The Cobbers are currently 18-1, ranked 17th in the latest CSTV/AVCA Poll and have won 18 straight matches. Middle hitter Jacki Barten(Melrose, Minn.) had a record-setting week. She was instrumental in Concordia's 5-0 week with wins over Bethel, Simpson, Loras, Central and Wartburg. In Concordia's 4-game win over eighth-ranked Central, Barten recorded a single-match, school record of 16 blocks. For the week, she averaged over 2.0 blocks per game. She also set the all-time record for blocks by a Concordia player in the Simpson match. Barten is on pace to break her own record for blocks per game in a season and total blocks in a season. Setter Jessica Walden (Hawley, Minn.) turned in another tremendous week as well, leading the offense to the team's perfect 5-0 record. She reached a personal milestone this weekend, as she tallied her 4,000th set assist for Concordia. At 4,149 assists, she continues to add to the record she already holds as Concordia's all-time set assist leader. This year Walden has directed the Cobber offense to an MIAC-leading .241 hitting percentage, while Concordia is holding its opponents to a league low in hitting percentage at .123. Cobbers Finish Off Border Battle Undefeated - Tie School Record For Win Streak! Cobbers Knock Off #8 Central. Cobbers Go the Distance to Fend Off Loras. Cobbers Start Border Battle By Smacking Simpson. - Jacki Barten breaks the school record for most career blocks!!! Cobbers Inch Their Way Closer to the Top, Now Ranked 17th in Latest CSTV/AVCA Poll!! Barten Blocks Bethel Into Oblivion - Cobbers Run Win Streak to 14! Cobbers Vanquish Hamline in Three Straight - Run Win Streak to 13! Cobbers Move Up One Place, Now Ranked 18th in Latest CSTV/AVCA Division III Poll!! Jacki Barten Named MIAC Hitter of the Week! Concordia senior middle hitter Jacki Barten (Melrose, Minn./Melrose HS) was named the MIAC Hitter of the Week as she helped the Cobbers win three straight conference matches. It is the third time in her career that she has earned the award. In Wednesday's five-game win over Macalester, Barten had 18 kills, six digs and two blocks. On Friday night against St. Olaf Barten finished with a match-high 17 kills, three blocks and three service aces. She capped her week by leading Concordia to a three-game sweep over St. Mary's. In that match she had 10 kills, but more importantly had four blocks and was part of a defense that limited Saint Mary's to only a .076 attack percentage on Saturday. In the past 92 matches, Barten has recorded at least one block. She now has 437 blocks in her career, and needs 16 more to break the school record for most blocks in a career. Cobbers Flex Their Muscles in Sweep Over St. Mary's. Another Five-Game Nailbiter, Another Cobber Victory. 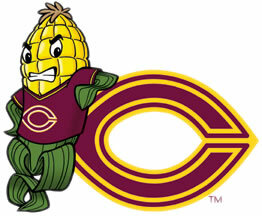 Cobbers Finally Beat Macalester in Five-Game Gut-Wrencher. Concordia Invitational Complete Final Results Now Online. Game-Weary Cobbers Claim First Concordia Invitational Since 1995. Cobbers Clear the Way for First Concordia Invitational Title Since 1995. Concordia Invitational Complete Final Results of Day 1 Now Online. Sixty-Minute Women; Cobbers Dispose of Valley City in Three Straight. One Streak Ends, Another Continues As Cobbers Beat Mayville State 3-1. Cobbers Ranked 21st in Latest CSTV/AVCA Division III Coaches Poll!! Cobbers Are Shark-Like at UC-Santa Cruz Tournament! -Concordia doesn't lose a game in cruising to tourney title! Surf's Up!! Cobbers Beach Southwestern in Opening Match of UC-Santa Cruz Tournament. Cobbers Scour the Comets to Give Tim Mosser 200th Collegiate Victory!! Cobbers Fall In Five-Game Thriller to MSU-Moorhead to Open Season. 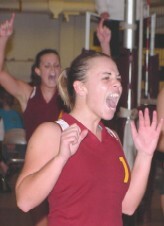 8/30 Cobber Volleyball Preview for 2004 Now Online! 7/20 Insurance, Returning Athlete, & 1st Year Participation Forms are Now Online.